The labeled ingredients in the canned mystery meat known as Spam are chopped pork shoulder meat, with ham meat added, salt, water, modified potato starch as a binder, sugar, and sodium nitrite as a preservative. More than just canned humor, the ingredients of Silhouette Stage’s production of Monty Python’s Spamalot include a hard-working cast, live music, hilarious songs, and a script featuring the witty and sometimes politically incorrect British humor of Monty Python! Winner of the 2005 Tony Award for Best Musical, Monty Python’s Spamalot is “lovingly ripped off from the motion picture Monty Python and the Holy Grail.” The title of the show comes from the line: “We eat ham, and jam and Spam a lot.” Eric Idle, a writer and actor in the legendary “Monty Python” TV series and movies, also wrote the book, lyrics, and music to Spamalot. John Du Prez who had a long association with Eric Idle shares in the music credit. 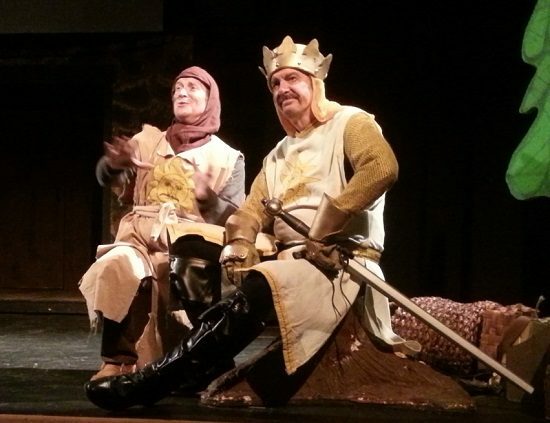 Overall, Silhouette Stages’s production of ‘Monty Python’s Spamalot’ has all the right ingredients of a fun show! Much like Monty Python’s TV sketch show, Spamalot is less about plot and more about making light of dark situations. But if you really want to know the basic story, and “if you accept that it hardly matters,” it concerns King Arthur’s (Mo Dutterer) attempts to gather up his “Knights of the Roundtable” while searching for the Holy Grail. Aided by Patsy (Jeremy Goldman), his loyal clip-clop sound technician and burden-carrier, they encounter diverse challenges through the countryside. Co-directors Conni Ross and Debbie Mobley not only assembled a hard-working cast, they also had the insight and skill to utilize each cast member to the best of his or her ability. You’ll die laughing, watching as Matt Wetzel plays a myriad of roles, including the Historian, Not Dead Fred, French Guard, Minstrel, and Prince Herbert. He plays up to the hilt his shorter stature, knowing no boundaries since the end result is a belly-full of hearty laughs from the audience. Choreographer Tina DeSimone has Matt doing all sorts of funny dance moves during the song “I Am Not Dead Yet,” such as the Charleston, a cartwheel, and a split. Later, Matt in his blue gown and brown wig transforms into a boyishly feminine Prince Herbert. Will he find his true love? Mo Dutterer as the handsome and strong King Arthur laments to Patsy saying, “Let me get this straight, I’m a King without a single knight to command. There’s nobody. I’m absolutely alone.” What makes this funny, of course is that he isn’t alone. He has his loyal friend Patsy who is always by his side. Singing “I’m All Alone,” Mo Dutterer’s voice is blissfully masculine while Jeremy Goldman’s eye expressions speak volumes when words and music aren’t enough to tell the story. Emma Jensen’s trained singing voice suits her well as the Lady of the Lake who is strong, beautiful, and possesses mystical powers. The talented female ensemble compliments her songs nicely: Christine Benkoski, Angie Townsend, Emily Biondi, Lisa Rigsby, Parker Bailey Steven, and Rachel Weir. Other supporting roles include Tommy Malek as Sir Robin, Ryan Geiger as Sir Lancelot, Jim Gross as Sir Galahad, Rich Greenslit as Mayor, and Neal Townsend and Lenny Taube as Sir Not Appearing in This Show. The talented male ensemble includes: Alex Pecas, Adam Abruzzo, Doug Thomas, Jim Baxter, Jose Teneza, and Vince Vueono. This production would not have been possible without Michael Tan’s terrific musical direction and keyboard playing. Other orchestra members include Greg Bell on bass guitar, William Georg on keyboard 2 and percussion, and Jeff Glass on drums. Overall, Silhouette Stages’s production of Monty Python’s Spamalot has all the right ingredients of a fun show! Disclosure: Mo Dutterer was my high school drama teacher. It in no way influenced the outcome of this review. Running Time: 2 hours and 10 minutes with one intermission. Advisory: Some profanity and mature situations. Monty Python’s Spamalot plays through March 22, 2015 at Silhouette Stages performing at Slayton House Theatre in Wilde Lake Village Center— 10400 Cross Fox Lane, in Columbia, MD. For tickets, call the box office at (410) 637-5289, or purchase them online.